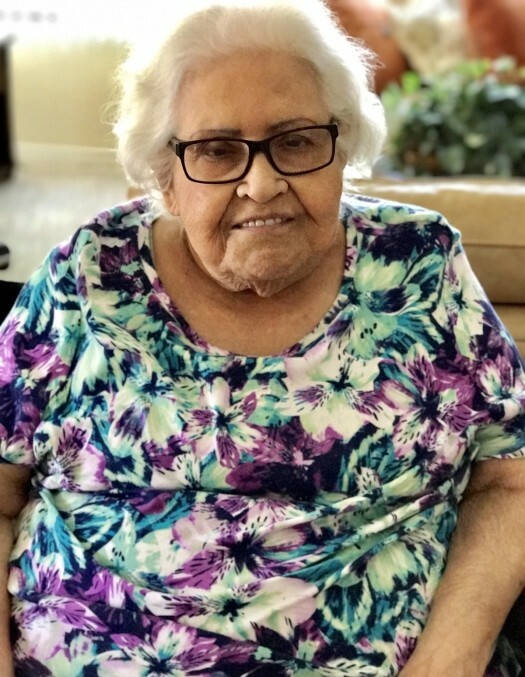 Elena “Helen” Camarena, 89, of Sun City West, AZ, formerly of Bettendorf, IA, passed away Wednesday, April 3, 2019 at her daughter Rosa’s home. She was surrounded by her children, their spouses, grandchildren and friends. Visitation will be Friday, April 12, 2019 from 4 to 7 p.m. at the Halligan McCabe DeVries Funeral Home, Davenport with additional visitation at church Saturday morning from 10:30 a.m. until the time of the Mass. Funeral services and a Mass of Catholic Burial for Helen will be at 11:30 a.m., Saturday, April 13, 2019 at Our Lady of Lourdes, Bettendorf. Burial will be in Mt. Calvary Cemetery, Davenport. Luncheon to follow at Our Lady of Lourdes. Memorials may be made to Southland Hospice, Phoenix, AZ (www.southlandhospice.com). Helen was born on Feb 22, 1930 in Bettendorf, a daughter of Jose and Rosa Sanchez-Carrillo. She was united in marriage to Manuel C. Camarena, on Aug 6, 1948 in Monterrey, Mexico. He preceded her in death on Mar 1, 2004 after 55 years of marriage. Helen was a loving sister and devoted wife, mother, grandmother, great-grandmother, and homemaker. Helen had an unwavering faith in God and was a member of St. Mary’s Parish and Our Lady of Lourdes Church. Helen’s faith guided her life, setting an example of good character, inner strength, enduring love and the value of family and friends as the center of her life. Helen shared her love as a gifted cook, and often brought family and friends together through preparing authentic Mexican meals. She generously shared and passed on these traditions to her children and grandchildren. Helen’s many interests included crocheting for her little ones, singing, dancing with her husband “viejo”, card games, watching movies, eating hot peppers (even on pancakes and hamburgers) and also loved to travel and enjoy new experiences. Helen especially cherished her 5 children, 19 grandchildren and 30 great – grandchildren; and they all loved and immensely cherished her. Those left to honor her memory are her children and their spouses: Rosa (Allan) Lynch, Sun City West, AZ. Joe (Angie) Camarena, Plano, TX. Mary Camarena, Bettendorf, IA. Manuel (Terry) Camarena, Bettendorf, IA. and Chris (Leasha) Camarena, Lodi, CA; grandchildren: Thomas Quigley, Jr. and his daughter, Kylie; Troy Vandel, and his children: Kennedy, Keaton and Kerrigan; Todd Vandel; Tara (Jason) Young and their children: Ethan and Ashlyn; Torrey Vandel; Sherry (Adam) Broshous and their children: Maxwell and Charlotte; Christina (Jason) Camarena-Andrew and their children: Javier “J.J.”, Elena, Emily and Salma; Joe (Anne) Camarena and their children: Joseph, Taylor, Brenna and Rhylee; Jennifer (Justin) Smith; David (Whitney) Camarena and their children: Dante and Wyatt; Leah Galaviz; Rick Camarena and his son Diego; Dan (Lindsey) Camarena and their children: McKenzie and Corben; Tony (Cristina) Camarena; Tim (Fernanda) Camarena; Christopher (Marissa) Camarena and their children: Cody and Macy; Michael (Robin) Camarena and their children: Ayden, Landon, Greyson and Emma; Melissa (Dustin) Maple and their children: Blake and Riley; and Nicholas Camarena; siblings: Reuben (Sandy) Carrillo, Richard Carrillo, Rosemarie (Al, Jr.) Beh, Rita Carrillo, Rachel Kraus, Peggy McDevitt.